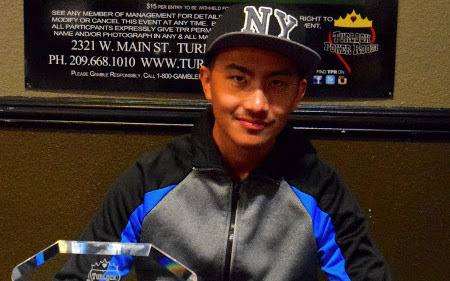 One of the top stacks for much of Day 2, and with the defending champion—his own sister—on his rail throughout, Tou Xiong took down the 2015 Players Championship Series Main Event last weekend at Turlock Poker Room in Central California. The 253-entry Main Event field, with a $122,705 prize pool, took on a family-reunion feel to it as Xiong had his sister Mai (the 2014 PCS Main Event winner), his wife, mother, brothers, sisters and more on his rail as he worked his way patiently through the field to take down the $34,257 first prize. An example of his patience: Three-handed play took nearly two hours for a single elimination as Xiong worked methodically to put himself in position to defeat Paul Mayer (2nd) and Seay Vay (3rd). Xiong, Mayer and Vay all spent time as the three-handed chip leader, although Xiong only gave up the top spot for a few hands each time before regaining control. Once heads-up, Mayer pushed all-in and doubled up quick, but a few hands later Xiong was on the winning end of an all-in, and the 13-hour final day came to a close. Xiong was embraced by family and enjoyed the celebration of the family’s second Main Event win in two years. The final table began with Damion Underwood, the eventual overall Series Champion, as chip leader and Xiong, Ken Huynh and Tuan Mai as the other top stacks. Play was as methodical as Xiong early on, then a rapid series of bust outs brought the field from nine down to four players in barely one 40-minute level. Underwood lost his chip lead on the wrong end of on all-in to Mayer with six players remaining, then he battled as a short stack until claiming fourth place. That finish, along with a victory in Event 7 and a fourth place in the opening event of the series, gave Underwood the overall series title and a fantastic prize. As Series Champion, Underwood receives one complimentary entry into every Turlock Poker Room tournament for a full year. This prize, along with the winner’s jacket, trophy and his photo banner to be hung in the poker room, is valued at more than $25,000. There was suspense down to the end over who would earn the Series Champion title, however. Ben Silva had cashed in the Main Event, earning additional points, and was entered in the final series event, a $115 with $50 bounties. Silva, Nabil Esho, Rick Peterson and Stephen Herrera all had a shot at the overall title based on how Underwood finished. With Underwood out fourth in the main, Silva was the only one left who could take the overall title, and he needed an Event 9 win. There was no last-minute win to be found, and Underwood claimed the title and the year’s worth of complimentary tournament entries. Turnout for every event of the series was strong, with the 253-entry field for the $550 buy-in Main Event setting an all-time record for field size for a Turlock Poker Room tournament. The overall Series Championship title kept a large group of players coming in daily in search of the top prize, with the top-10 in points constantly shuffling around. 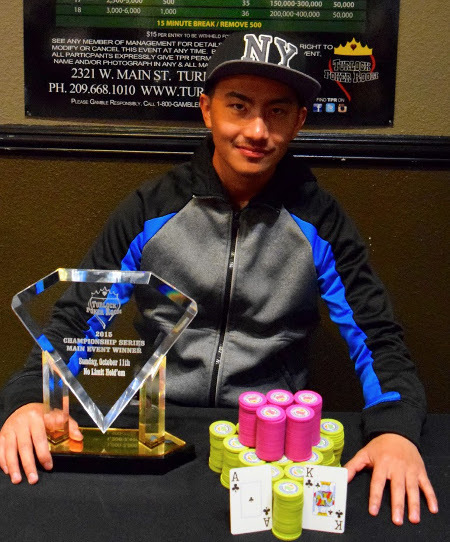 The Main Event final table and payouts were: 1st, Tou Xiong, Merced, $34,357; 2nd, Paul Mayer, Turlock, $20,246; 3rd, Seay Vay, Merced, $13,498; 4th, Damion Underwood, Turlock, $9,387; 5th, Tuan Mai, San Jose, $6,994; 6th, Armando Perez, Modesto, $5,399; 7th, Mike Espinoza, Stockton, $4,172; 8th, Jose Covarrubias, Turlock, $3,068; and 9th, Tony Martin, Modesto, $2,209. Other winners during the 2015 Players Championship Series included: Connor Henderson, Event 1, $180 with $50 Bounties; Rick Peterson, Event 2, $230 Hold’em; Jeremy Gates, Event 4, $75 ‘Raise It’ ; Stephen Herrera, Event 5,- $100 with $25 Bounties; Howard “Tahoe” Andrew, Event 6, $125 Omaha 8; Damion Underwood, Event 7, $115 with $50 Bounties; Rodney Washburn, Event 9, $115 with $50 Bounties.